Do you want to increase your flow of abundance? Maybe you feel stuck at your current income level and you can't see how you could possibly bring in more? you need to clear what's in the way! and clears them out for good! immerse yourself in the universal flow of abundance. Each week you'll receive 1-2 journal prompts to get you working through whatever has been holding you back until now. all about clearing your blocks and getting intentional about money! I've been a counsellor and alternative therapist for over 10 years. I'm also a best-selling author, intuitive healer and a meditation creator. The very second I learned about the law of attraction I started trying it out. I had some amazing wins, but I soon realised that without doing the inner work, my level of wealth wasn't going to increase beyond what I was already aligned with. Over the years, I've cleared out layers of beliefs, old money stories and loads of blocked energy, and my income has grown exponentially. In 2018 I've already attracted double the income that I did last year! I know that clearing money blocks is an ongoing process. Whenever you strip away a layer and clear out the crap, you increase your ability to receive even more. My mission is to help you to master the up-levelling process so that you can repeat it with ease. You can't clear your blocks until you know what they actually are. During this first week you'll make your peace with your current money situation and prepare yourself to be free from money blocks. This week you'll bring everything to the surface so that you can get started on clearing these blocks ASAP. Discover how you're getting in your own way and syphoning your money out of your life through self-sabotage, then put a stop to it immediately! This is where you'll go deep and unhook yourself from old patterning in order to align with your desires with fresh energy. Without moving past old beliefs, you'll always stay stuck. This week you'll pull the plug on your outdated beliefs and pave the way for new beliefs that are in perfect alignment with your goals. You'll bust through any remaining blocks, beliefs, rules or self-talk that's standing between you and your dreams as you surrender EVERYTHING that's not working for you once and for all. Now that you've cleared out all the stuff standing in the way of the flow of abundance, you can get started with the fun stuff! 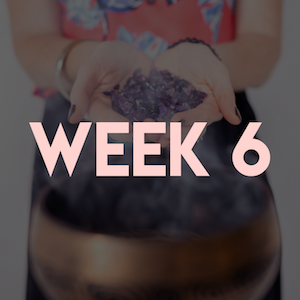 During this final week you'll be embodying your desires and cranking up your attraction level to overdrive. We begin this week - starting 25th June but it's not too late to join! Enrolments are open til Friday 29th. I don't know if I'll be able to catch the livestreams. Should I still sign up? YES! You will have opportunities to submit questions that I will cover in the live videos and the replays will be available in the group for you to catch up with. How much time do I have to commit each week? It's hard to say exactly, but the journalling and the meditations combined could easily be completed in less than an hour each week. 15 Minutes a day is a great goal to aim for to create lasting change. But if you miss a day or a week, there will always be time to catch up later. I need some extra support to actually DO the exercises or work through a block that I'm having trouble clearing. Can I work with you privately during the program?